Point Fraser is a relatively new recreational reserve located on the Swan river foreshore only a few steps away from the Perth CBD. These fabulous wetlands are made up of a series of lakes, boardwalks, children's playground and interpretive trails. Take a walk or cycle the new boardwalk along the Swan River foreshore. Or follow your nose along the interpretive trails to learn stories about the area including historical, environmental and indigenous issues. Did you know Point Fraser is built on land that was reclaimed in the first half of last century? Or that the wetland is treating the stormwater run-off from the East Perth Catchment? Since the Point Fraser demonstration wetlands have been introduced, migratory waders are beginning to return to the area. Spot a great egret, a ballion's crake or bar-tailed godwit at Point Fraser wetlands. These birds love dense rushes and sedges for nesting. 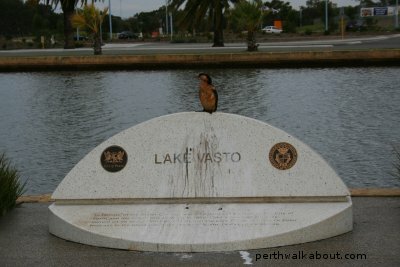 The series of lakes at Point Fraser also include Lake Vasto. Vasto in the region of Abruzzo, Italy is one of the City of Perth's sister cities. What bird is that in the photo of Lake Vasto featured on the right? For those bird enthusiasts, if you can identify the bird featured in the photo, please contact us at PerthWalkabout and let us know. Travel along Riverside Drive from the Causeway and the Point Fraser car park is located on the near left as you exit off the Causeway. Better still walk or cycle to Point Fraser. Follow the shared path (cycling/walking) along Riverside Drive (if heading from the Narrows Bridge, Western Side of Perth or from Barrack Street Jetties) till you get to just before the Causeway Bridge (Eastern side of Perth). 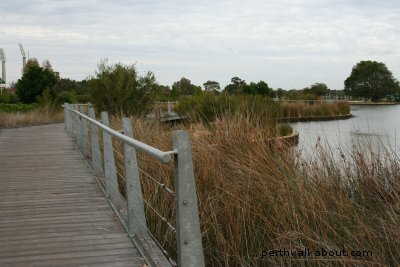 Point Fraser can also be reached by accessing the shared path from Victoria Park, South Perth, East Perth or Burswood.